First out of the gate this week has been Arista, with their 7050S-64, 1U switch, with 48 dual-speed 1G/10G SFP ports and four 40G QSFP ports, 1.28Tbps of switching, 960Mpps, 9MB of packet buffer, front-to-back airflow for friendly top-of-rack deployment, etc, etc. 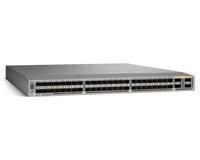 Next to arrive at the party is Cisco, with their Nexus 3064, 1u switch, with 48 dual-speed 1G/10G SFP ports and four 40G QSFP ports, 1.28Tbps of switching, 950Mpps, 9MB of packet buffer, front-to-back airflow for friendly top-of-rack deployment, etc, etc. Whoa! Anyone else getting deja vu! Are they related? I think we should be told! Both switches are so similar that they even offer the ability to plug a “breakout cable” into the 40G QSFP ports and turn each one into four 10G ports, giving you a 64x10G port system. They even outwardly look like relatives, just some slight differences in how the face-plate looks, with the Arista box managing to get it’s management ports on the front of the box, where Cisco don’t seem to. The same journalist at El Reg did articles on both the Arista and Cisco launches this week, and they had to have been feeling that same sense of deja vu when looking at the product releases, and when interviewing the product managers. Arista make no secret of the fact that they don’t develop switching and forwarding silicon in house. Their niche is in integrating merchant silicon from the likes of Broadcom and Fulcrum into a stable package that users can deploy, and their “secret sauce” is their software, which is surprisingly open for a networking hardware shop – it’s based around Linux, and you can actually touch the OS itself, rather than it remaining annoyingly veiled behind a vendor specific shell that you can’t break out of. With most, you know it’s there, but you can’t touch, but not the case on Arista. Cisco, meanwhile, have a long tradition of developing their own silicon, being one of the few hardware vendors in Silicon Valley to maintain their own silicon design teams in house. Many others, dispensed with the need to spin their own chips for switching and forwarding with the advent of capable merchant silicon (such as Broadcom’s StrataXGS) around 2002/2003. So, is the similarity in speeds and feeds just a coincidence, or did Cisco buy in the chips for this one? Well, until someone gets one of them and pries the heatsinks off, we won’t know for sure. Could it just be that this is the limit of what can be made to run in a stable manner with current technology? Cisco state that the “typical operating thermal envelope” of the Nexus 3064 is around 286W, while it has two 400W power supplies (which being redundant, in theory the worst-case draw is going to be 400W). Meanwhile, the Arista product manger comes up with a smaller headline number (remember, small is good here) of 125W (i.e. about the same as an old-school tungsten filament light-bulb) by coming up with a bizarre specific config of “64 ports of 10G at 50% load using Twinax copper cables”. Huh? Given the similarity of speeds and feeds, it’s really likely they won’t be far apart in terms of power usage, so why even bother with this masked charade? Yes, I know, this is nothing new, vendors have been massaging figures since time immemorial, an old chestnut being the “doubling” of throughput figures for a device by counting every bit of data twice, once on ingress and again on egress. Some insisted this is correct as the “device is performing two operations on the packet, once on ingress and again on egress”, while others argued that since they did all the lookup and classification work on ingress, counting once was the correct way. Any good network equipment buyer will see through these numbers and look beyond them, either at the “real” specs, when making their purchasing decision, or will ask appropriate questions along the way. It’s something we’ve been doing for years, in any case, at least for as long as the vendors have been massaging the performance data. However, imagine if this didn’t happen, and vendors didn’t waste time and money in massaging the data to get a hollow “one up” on a competitor? What if there was some clarity in the information you could get, and you could actually have a >50% level of confidence so as a buyer you didn’t have to re-verify everything for yourself? Why is it like this? Anyone who has been in the industry long enough will know that many marketers and product mangers in Silicon Valley are a pool of people who ride a merry-go-round between the various tech companies. There really doesn’t seem to be any new blood coming in. They leap from one place to another, but don’t seem to be able to “put right what once went wrong”, instead only succeeding in doing the same thing in their new place as they did in their last. The leopard can’t change it’s spots. I think this could be a missed chance for Arista – not the technology, but how they position themselves. They started out being very technically led, and with some fairly straight talking marketing for an Ethernet switch company, certainly compared to what people had become used to. They let the products somewhat speak for themselves, which they did very well. There was that fantastic interview with Andy Bechtolsheim – which I’ll paraphrase as “switches and networks have become too complicated, why aren’t they as reliable as my iPhone?” – boy, did that feel good to a jaded network architect, used to the same old fluff. I think it’s a shame they seem to have fallen off that particular wagon. I’ll still readily accept that when you get to a point of selling a similar product to a competitor, as has happened here, you do need some way to differentiate yourself from the competition. Great, but change the record, please. Rather than falling back on the old staple of massaging the numbers, how about some straight-talking, free of corner-case scenarios and weasel words? I know it’s got to be hard to break out, but what a refreshing change it would be. Probably worth a mention is Force 10’s almost identical offering that I saw on a stand at an event recently. It looked exactly like the Arista but a different shade of grey, and I think the sales chap mentioned TRILL but I can’t find this on the spec sheet. Ed: Ah, you mean the S4810, that was announced some time ago (there’s this El Reg article from November of last year), though does look a lot like the Arista product. Given Arista’s claims to be the first to deploy a box with the Trident+ silicon, I wonder if the F10 product has the vanilla Trident inside? As The Register points out, Force10 can be cagey about who’s silicon they are using – at least publically – while Arista seem more open about this, which I would say is a step in the right direction. The Arista is Broadcom Trident Plus. The Cisco is Broadcom Trident. F10 is Broadcom Trident. Juniper is Trident (or maybe Plus) with some custom chip for the FCoE stuff. The typical numbers mean typical. Arista tells you want that means, Cisco does not. Max draw on the Cisco is ~400W. ~200W on the Arista. The Arista has the lowest latency of the 3. I’ve spoken to Arista a lot over the years, including when they were Arastra, and were still developing their first products… While they do make it clear what it means when they say 125W, it just feels like they had to come up with a massaged spec to get that 125W, and I guess that hearing that out of Arista surprised me, especially when it looks like they didn’t need to do it, as even their worst-case power draw seems better than the competitors’ average, which speaks volumes.